Make it easier for your sales reps to increase their sales by creating a product catalog. The product catalog is a collection of products and their pricing information. To set up pricing, you need to define the units in which your products are sold, the amount to charge for each unit, and the discounts you want to offer based on volume purchased. This feature was introduced in CRM Online 2015 Update and CRM 2015 (on-premises). Interested in getting this feature? Find your Dynamics 365 administrator or support person. Create discount lists to offer your products and services at different prices, depending on the quantity purchased. Define the measurements or quantities your products will be available in. Create products for the items you sell. You can create a standalone product or a product inside a family depending on how you want to organize and classify your products. 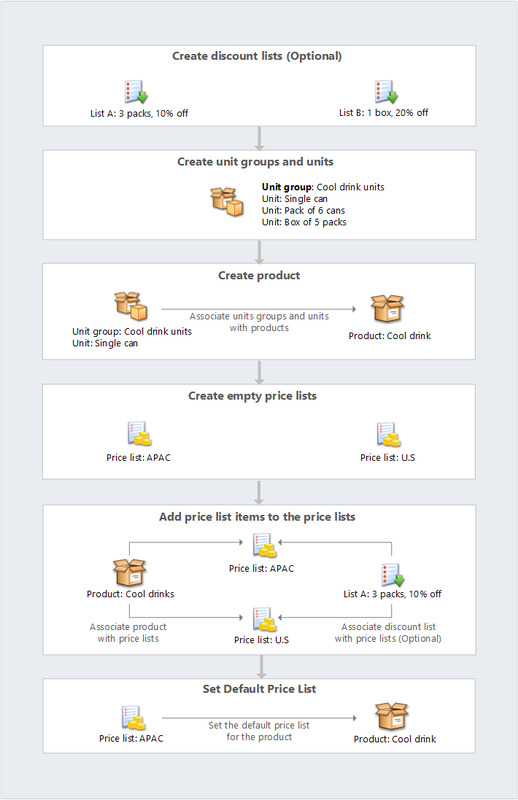 Each product you create will be linked to a unit group and default unit. You can also create a standalone bundle or a bundle inside a product family. Define pricing for your products. Add price list items. A price list item defines the price per unit of a product. Add each new product to one or more price lists as price list items. You can do this either from the product form or the price list form. Select one of the price lists to which you added the product as the default price list for the product. Microsoft Dynamics 365 uses the default price list for calculations when the associated price list in the opportunity or order for the product doesn’t contain a price definition of the product.